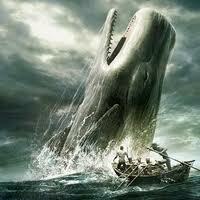 For several days after leaving Nantucket, nothing above hatches was seen of Captain Ahab. The mates regularly relieved each other at the watches, and for aught that could be seen to the contrary, they seemed to be the only commanders of the ship; only they sometimes issued from the cabin with orders so sudden and peremptory, that after all it was plain they but commanded vicariously. Yet, their supreme lord and dictator was there, though hitherto unseen by any eyes not permitted to penetrate into the now sacred retreat of the cabin. Every time I ascended to the deck from my watches below, I instantly gazed aft to mark if any strange face was visible; for my first vague disquietude touching the unknown captain, now in the seclusion of the sea became almost a perturbation. This was strangely heightened at times by the ragged Elijah's diabolical incoherences uninvitedly recurring to me, with a subtle energy I could not have before conceived of. But poorly could I withstand them, much as in other moods I was almost ready to smile at the solemn whimsicalities of that outlandish prophet of the wharves. But whatever it was of apprehensiveness or uneasiness- to call it so- which I felt, yet whenever I came to look about me in the ship, it seemed against all warranty to cherish such emotions. For though the harpooneers, with the great body of the crew, were a far more barbaric, heathenish, and motley set than any of the tame merchant-ship companies which my previous experiences had made me acquainted with, still I ascribed this- and rightly ascribed it- to the fierce uniqueness of the very nature of that wild Scandinavian vocation in which I had so abandonedly embarked. But it was especially the aspect of the three chief officers of the ship, the mates, which was most forcibly calculated to allay these colorless misgivings, and induce confidence and cheerfulness in every presentment of the voyage. Three better, more likely sea-officers and men, each in his own different way, could not readily be found, and they were every one of them Americans; a Nantucketer, a Vineyarder, a Cape man. Now, it being Christmas when the ship shot from out her harbor, for a space we had biting Polar weather, though all the time running away from it to the southward; and by every degree and minute of latitude which we sailed, gradually leaving that merciless winter, and all its intolerable weather behind us. It was one of those less lowering, but still grey and gloomy enough mornings of the transition, when with a fair wind the ship was rushing through the water with a vindictive sort of leaping and melancholy rapidity, that as I mounted to the deck at the call of the forenoon watch, so soon as I levelled my glance towards the taffrail, foreboding shivers ran over me. Reality outran apprehension; Captain Ahab stood upon his quarter-deck. There seemed no sign of common bodily illness about him, nor of the recovery from any. He looked like a man cut away from the stake, when the fire has overrunningly wasted all the limbs without consuming them, or taking away one particle from their compacted aged robustness. His whole high, broad form, seemed made of solid bronze, and shaped in an unalterable mould, like Cellini's cast Perseus. Threading its way out from among his grey hairs, and continuing right down one side of his tawny scorched face and neck, till it disappeared in his clothing, you saw a slender rod-like mark, lividly whitish. It resembled that perpendicular seam sometimes made in the straight, lofty trunk of a great tree, when the upper lightning tearingly darts down it, and without wrenching a single twig, peels and grooves out the bark from top to bottom ere running off into the soil, leaving the tree still greenly alive, but branded. Whether that mark was born with him, or whether it was the scar left by some desperate wound, no one could certainly say. By some tacit consent, throughout the voyage little or no allusion was made to it, especially by the mates. But once Tashtego's senior, an old Gay-Head Indian among the crew, superstitiously asserted that not till he was full forty years old did Ahab become that way branded, and then it came upon him, not in the fury of any mortal fray, but in an elemental strife at sea. Yet, this wild hint seemed inferentially negatived, by what a grey Manxman insinuated, an old sepulchral man, who, having never before sailed out of Nantucket, had never ere this laid eye upon wild Ahab. Nevertheless, the old sea-traditions, the immemorial credulities, popularly invested this old Manxman with preternatural powers of discernment. So that no white sailor seriously contradicted him when he said that if ever Captain Ahab should be tranquilly laid out- which might hardly come to pass, so he muttered- then, whoever should do that last office for the dead, would find a birth-mark on him from crown to sole. So powerfully did the whole grim aspect of Ahab affect me, and the livid brand which streaked it, that for the first few moments I hardly noted that not a little of this overbearing grimness was owing to the barbaric white leg upon which he partly stood. It had previously come to me that this ivory leg had at sea been fashioned from the polished bone of the sperm whale's jaw. "Aye, he was dismasted off Japan," said the old Gay-Head Indian once; "but like his dismasted craft, he shipped another mast without coming home for it. He has a quiver of 'em." I was struck with the singular posture he maintained. Upon each side of the Pequod's quarter deck, and pretty close to the mizzen shrouds, there was an auger hole, bored about half an inch or so, into the plank. His bone leg steadied in that hole; one arm elevated, and holding by a shroud; Captain Ahab stood erect, looking straight out beyond the ship's ever-pitching prow. There was an infinity of firmest fortitude, a determinate, unsurrenderable wilfulness, in the fixed and fearless, forward dedication of that glance. Not a word he spoke; nor did his officers say aught to him; though by all their minutest gestures and expressions, they plainly showed the uneasy, if not painful, consciousness of being under a troubled master-eye. And not only that, but moody stricken Ahab stood before them with a crucifixion in his face; in all the nameless regal overbearing dignity of some mighty woe. Nevertheless, ere long, the warm, warbling persuasiveness of the pleasant, holiday weather we came to, seemed gradually to charm him from his mood. For, as when the red-cheeked, dancing girls, April and May, trip home to the wintry, misanthropic woods; even the barest, ruggedest, most thunder-cloven old oak will at least send forth some few green sprouts, to welcome such gladhearted visitants; so Ahab did, in the end, a little respond to the playful allurings of that girlish air. More than once did he put forth the faint blossom of a look, which, in any other man, would have soon flowered out in a smile.